September | 2016 | LIT.GAZ. 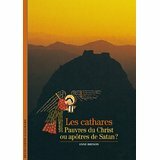 Anne Brenon is one of the foremost experts on the history and theology of the Cathars, so I took her book to re-read on my recent trip to the Aude department of southern France as I set off to visit some of the sites where they lived and were ultimately wiped out by the Church in the twelfth and thirteenth centuries. It’s one in an excellent and long-running series from the publishers Gallimard, where a topic, theme or idea is explored in depth in a copiously illustrated main section, which is supported by a supplementary document and bibliography section at the end. Some of their titles were taken up and translated by Thames and Hudson a couple of decades back, but that enterprise seems to have petered out. Fascinating places which I really enjoyed visiting, and very interesting episode of mediaeval history. Brenon’s book was a very useful companion: there’s sufficient information to make one feel informed properly without being overloaded, it’s well-organised and illustrated. This semi-humorous Victorian work conceals quite a hefty punch behind its deliberately understated exterior. I first came across it at school and enjoyed it then; I think it’s the first time I’ve been back to it, whilst on a recent touring holiday, courtesy of the excellent Librivox website. 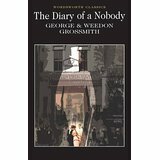 For a couple of years Charles Pooter keeps a diary of his life beginning from the day he and his wife Carrie move into their new rented house in Holloway; they are soon joined by their (for Victorian times) raffish son Lupin who has been ‘let go’ from his job with a bank in Oldham. Charles has a job with a broking firm of some kind in the City, and is moderately successful. They both have a group of rather dull and sometimes boorish friends and relations. If everything so far sounds almost deliberately dull and boring, that’s because surely it’s meant to. The adjective, ‘pooterish’, has passed into the language. The family is very petty bourgeois in its tastes, lacking in wit, liveliness, interests, not wanting to offend anyone, or to be offended. No-one has an interesting or original thought in their head… The most enterteining and subversive moment of the novel comes when the Pooters somehow end up at a social occasion where the guest of honour is an American writer who deliberately challenges his hosts’ attitudes, beliefs, and everything they do and stand for – no doubt in the stereotypically rude and outspoken American fashion that people used to condemn in Victorian times – and Charles Pooter, to his horror, finds himself acknowledging the truth of what the guest is saying and agreeing with him! Fortunately, this wobble is only brief, and our anti-hero shakes off his temporary rebellion and returns to normal. What is really challenging about The Diary of a Nobody, what makes is so very different from that other gem from those times, Jerome K Jerome’s Three Men in a Boat, is that the Grossmiths inevitably get their reader reflecting on her or himself: we come to realise, as we mock the Pooters for their tedious ordinariness, that there is some, if not a lot, of that ordinariness in our own lives, no matter what story we may tell ourselves and others about how interesting and exciting our lives are. For do not we live in ordinary houses, often in suburbs, where we wrestle with the daily chores of shopping, tradesmen, making the house into a nice home, whilst dealing with our awkward children? And are not our values, beliefs and attitudes replicas of those with whom we spend our time? Are we really any different from the norm, or are we kidding ourselves? If what we seek in our lives is contentment, and surely there is nothing wrong with that as a goal, then the ending of the book is comforting, as Mr Pooter gets a promotion which means he will be financially secure for the rest of his life, and his son lands a decent job. But it’s also very scary: where is the excitement, the adventure we feel we need?